Microsoft Exchange Online Archiving, or more commonly known as in-place archive, is a cloud-based, enterprise-class archiving solution for email archiving, compliance, regulatory, and eDiscovery purpose. Exchange Online Archiving is compatible with Exchange Server 2010, 2013, 2016 and later, and is also available as an add-on service for mailboxes that are hosted online through Exchange Online or other Office 365 SKUs. All Exchange Online plans (except Exchange Online Kiosk plan and Office 365 plans that include Exchange Online Kiosk such as Office 365 Enterprise K1 and Office 365 Government K1) have built-in support for in-place or cloud archiving of Exchange mailboxes. However, an Exchange Online Archiving (EOA) plan can be subscribed to add the support for in-place archive and unlimited archive storage. Exchange Online Archiving (EOA) is now available as an add-on for Enterprise K1,K2, E1, A2, G1, and Exchange Online Plan1, Exchange Online K SKUs at a cost of $3.00 per user license per month. Other than Exchange Online Kiosk plan, Exchange Online has two more options, namely Exchange Online Plan 1 and Exchange Online Plan 2. The differences between Exchange Online Plan 1 and Plan 2 in term of online archiving is that Exchange Online Plan 1 (and all Office 365 plans that include Exchange Online Plan 1 such as Office 365 Business Essentials, Business Premium, Enterprise E1, Government E1 and Education E1) has the storage limit of 50GB, and is shared among primary mailbox and archive mailbox. Meanwhile, Exchange Online Plan 2 (and all Office 365 plans that include Exchange Online Plan 2 such as Office 365 Enterprise E3, Education E3, Government E3, Enterprise E4, Education E4 and Government E4) has unlimited storage for archive mailbox, so you can store as many emails as you like in the archive while the primary mailbox can contain up to 50GB of space. One IMPORTANT thing to note is that if you’re using Microsoft Outlook desktop app, the in-place online archive mailbox is only visible in Outlook installed via Professional Plus edition, or through Office 365 ProPlus subscription (and Office 365 plans of E3 and E4 values). Outlook from other editions of Office such as Office Home & Student, Office Home & Business, Office Standard and Office Professional will not display the archive mailboxes even though they’re present, available and supported. The workaround is to use Outlook Web App (OWA) to access the archive. Login to Office 365 admin center as an administrator. 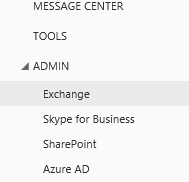 Select Exchange under “ADMIN” branch in the lower left corner of the left pane to log into the Exchange admin center. If not yet selected, go to mailboxes tab. Select the mailboxes that you want to enable the in-place email archiving. Once the users are selected, scroll down to the In-Place Archive section in the right most pane, and click or tap on Enable. If you selected multiple user accounts (by pressing Ctrl or Shift key), scroll down to click or tap on More options. In the warning dialog box, click or tap on yes to enable the in-place archive. You will see a slightly different confirmation dialog box for “bulk enable archive” if you enable or turn on online archiving for multiple mailboxes at one go. 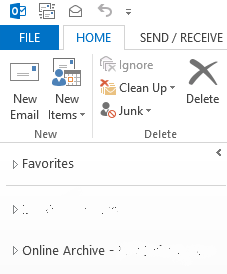 Click OK.
A new mailbox called “In-Place Archive – <User Name>” in Outlook Web App or called “Online Archive – <User Name>” in Outlook will appear together with main mailbox automatically. 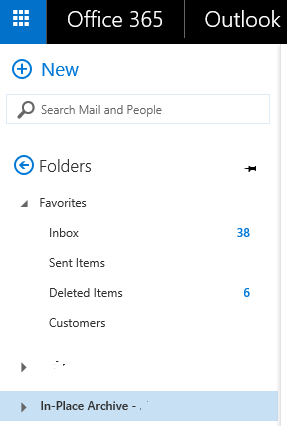 In Outlook Web App (OWA), click on More to see all folders and mailboxes. The archive mailbox is now ready to use. Users can drag and drop mail messages from primary mailbox or PST into the archive, create new folders in the archive, utilize the archive mailbox in the rules and email retention policies, export or import messages to and from the archive mailbox, and etc. Users can use the web-based Outlook Web App (OWA), Outlook 2007, Outlook 2010, Outlook 2013, Outlook 2016 and later version to access the online in-place archive mailbox. Do note that archive mailboxes are only stored in the cloud, and thus are only available when Outlook is connected to the Exchange server or Exchange Online via RPC (over TCP) connection or Outlook Anywhere (aka RPC over HTTP). In other words, users have to be online. 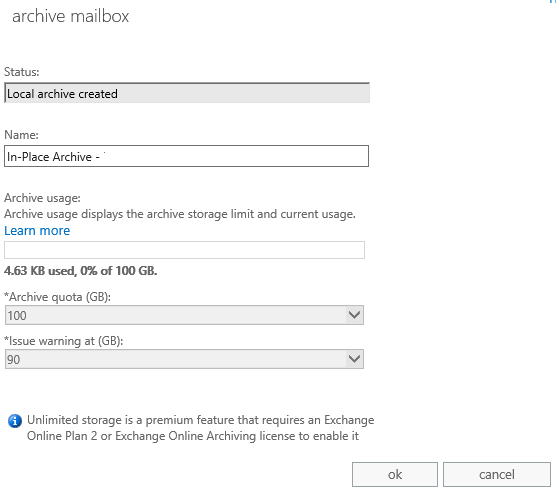 That’s because even if the Outlook profile is configured to use Cached Exchange Mode, the archive mailbox is never cached locally to the user’s computer, unlike the primary mailbox and Inbox. When the user is no longer connected to Exchange, the archive mailbox becomes inaccessible. Unfortunately, Exchange ActiveSync protocol, used popularly in mobile devices such as Android, iOS (iPhone and iPad) and third party email clients does not support archive mailbox. You will need to download and install OWA app from respective app store to view the online archive. Administrator can view the details on archive mailbox for users who have it turned on. 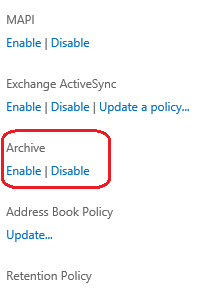 To do so, in the same Exchange admin center’s page, select View Details under the “In-Place Archive” section. The details page will display the status, name of the folder in the user’s mailbox that contains the archive (you can change the name if you prefer), archive storage limit and current usage, archive quota, and warning threshold. 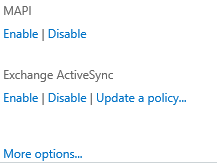 In addition, the default archive and retention policy of Exchange, namely the Default MRM Policy, is applied automatically to new mailboxes if administrator enables In-Place Archive for a mailbox user and the mailbox doesn’t already have a retention policy assigned. Under the default policy, messages are automatically moved to the archive mailbox after two years. Retention policy will not run automatically for mailboxes that are smaller than 10 MB. The service description of Exchange Online Archiving can be found on TechNet.